THIS ITEM IS NOT AVAILABLE AT PRESENT. 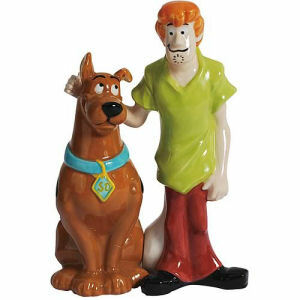 WE WILL NOT BE GETTING ANYMORE Scooby-Doo and Shaggy Salt and Pepper Shakers. We apologize for any inconvience. From the Scooby Doo collection by Westland Giftware. Scooby-Doo and Shaggy Salt and Pepper Shakers. This Scooby-Doo salt and pepper set measures 4.25 Inches tall.Made of ceramic. Westland Giftware Scooby Doo Salt and Pepper Shakers shipping from Canada. No Surprise Border fees or Customs!